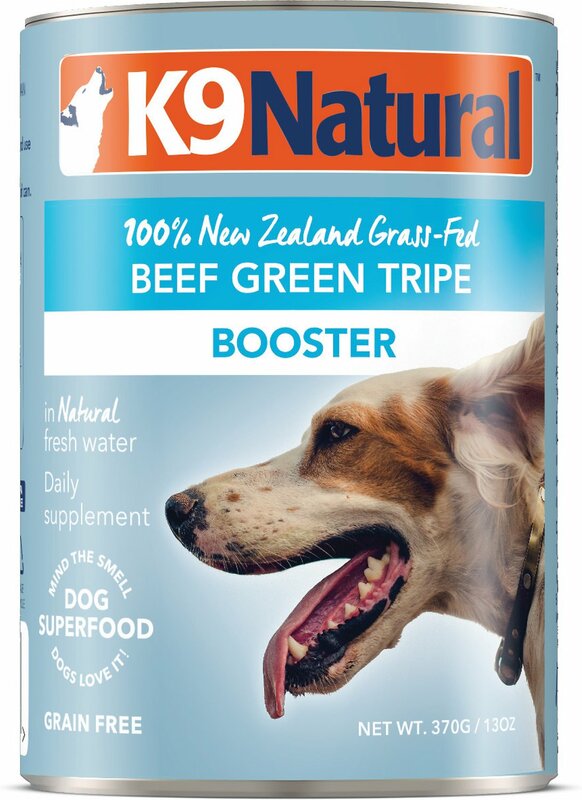 Treat your pup to wholesome goodness with K9 Natural Booster Beef Green Tripe Grain-Free Canned Dog Food Supplement. This highly palatable superfood is excellent source of protein and great for supporting digestive health. It's packed with New Zealand wholefood ingredients, so you can feed your pup only the best nature can offer. Dense nutrients give your dog that extra boost when you feed to your pup as a daily supplement or as a topper for your dog’s existing diet, whatever that may be. Wet food offers a nutrient-dense, high-meat boost and are a great way for enticing picky eaters, too! Made with 100% green tripe to create a high-meat nutrition and flavor boost your pup will love you for. Free from grain, gluten, GMO ingredients, corn, soy, dairy, rice, cereals, potato or other gelling agents or fillers—so it's safe for even sensitive pups. Packed with fresh wholefood New Zealand ingredients, New Zealand water for hydration and essential vitamins, minerals & oils. Serve as a daily supplement on its own or as a nutrient-packed topper for an easy, tasty nutrition boost. Show your pup how much you love her by adding naturally better nutrition to her daily meal. Beef Green Tripe. Water added for processing. For your protection, keep separate from other foods, wash hands and surfaces thoroughly after handling. Have not tried the canned Green Tripe as yet, still in case as not finished with Sadie's case of canned beef. I have heard that it doesn't have a very pleasant smell for humans, but pups LOVE it. Sadie only diets on K9 Natural and she has tried just about every flavor except this one ~ loves them all so I'm sure she will love this one also. This food smells bad (to me) and doesn’t look very appealing, but Clifford absolutely loves it. I also noticed that it does not upset his very sensitive stomach. Will continue buying it. I have two five year old corgis and I put this on a freeze dried food as a topper. They gobble it up. Love that its from New Zealand.